The field of tissue engineering has grown in recent years as new uses for engineered tissues emerges These include model organ or organ substitutes, limited in quantity in our aging society with prevalent chronic diseases. Tissue engineering methods opens a door to the production and replacement of tissues and organs. Tissue engineering has always been done using scaffolds, but this is a slow process. 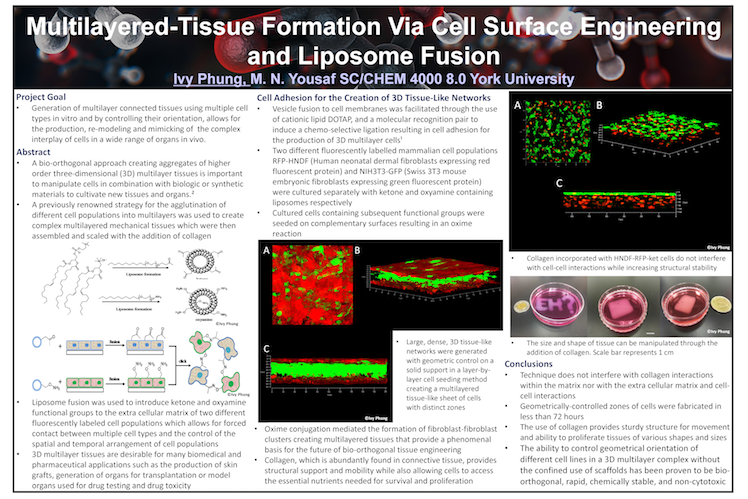 The idea of my project was to create scaffold-free production of tissues based on cell sheets or cell aggregates. A bio-orthogonal approach was used for the agglutination of different cell populations into multilayers. Liposome fusion is used to introduce ketone and oxyamine functional groups to the extra cellular matrix of two different cell populations. The formation of oxime bonds allows for the production of thick monolayers, creating aggregates and 3D structures. Complex multilayered mechanical tissues are able to be assembled and scaled, with the addition of collagen. Collagen is incorporated in order to produce mechanically viable tissues. The ability to control the orientation of cells in collagen is extremely important in organ production because organs are a complex network of cells that work together while proliferating in their separate regions. The results of my project show great promise for the future of tissue assemblies. Using different types of skin cells, fabricating a skin graft would take no more than three days rather than weeks. Further research can include the creation of a liver chip for use in drug toxicity.